This extension saves their time in searching for the product and also assist them in shopping within their shopping budget. The extension is simply easy to manage from the backend. KENNESAW, Ga. - Oct. 4, 2016 - PRLog -- There are many customers who prepare a budget for shopping and then buy the products accordingly. People also look for the products of a certain price range to suit their style or convenience. 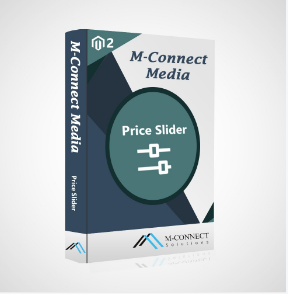 However, to make your customers shop effortlessly within the defined price range, M-Connect Media has released a Price Slider Extension for Magento 2. Kennesaw, Georgia, September 4rd October 2016 – M-Connect Media recently declared a new extension for Magento 2 platform, Price Slider. This extension displays a slider under the price filter instead of various defined price ranges to make the customers select the range as per their convenience. M-Connect Media, as an eCommerce and Magento Service Provider always try to create something for Magento platform which improves the performance of the eCommerce businesses. The Price Slider extension will help the shop owners to create effortless shopping experience for their customers. The most common issue which a user faces with the product price is that they don't get the proper options to select a range to search the products. Some eCommerce companies do offer this feature but they manually create some range with a tick box. It is helpful to some of the customers but not to every population. It may happen that the desired range within which they want a product, is not added in the options. So, there should be some solution to it. After adding this extension to your Magento 2 based store, you can activate the extension from the backend. And a slider with a minimum and maximum price value will appear under the Price filter. This extension automatically selects the minimum and maximum value for slider as per the products lowest and highest price. The customer just need to slide the bars to adjust their range on the slider and the products within that range will appear in the search results. On the release of the Price Slider extension, we asked the spokesperson to throw some light on this extension. He said, "With large number of products under a category, it made difficult for the customers to search for their desired products from that pool. We have seen that either they got the option of sorting the search results either starting with lowest/highest price or checking the box for a price range mentioned. We thought what if they need a product within a defined price range which is not mentioned in the filters, they still have to search lot of products. So, we designed the slider for the price filter using which the customers can manually select the minimum and maximum price range for product search." The products on the search results will appear without making the page reload. Once you select the price range on the slider, the Ajax technique will make the products appear with any redirect or reload.